Give guests their hotel key in style with a custom-designed key card holder. Key sleeves keep the card inside secure and mobile, while key card folders provide additional design space. Front Desk Supply designs custom key card holders for hotel chains and luxury resorts. Our custom key and card holders are expertly designed to match your brand. 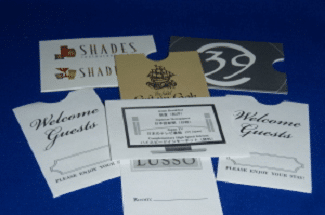 Make your guests stay memorable and hotel profitable. Call 888-859-2061 to speak with one of our helpful representatives to discuss your custom key card holder. Key card folders hold key cards within a pocket style folder. Providing your guests with a memorable service by including important information about the hotel: check-out times, car rental info, room service & directory numbers, traveler’s safety tips and restaurant & tourist attractions. Front Desk Supply customizes 1 – 2 pocket style key card folders in several sizes to compliment your brand. Key sleeves provide protection, extending the life of a hotel key card, while offering a convenient place to note the hotel room number for guests. Front Desk Supply offers economical and high end key sleeves for RFID and magstripe keycards. Guests use hotel key card holders approximately 15 times during their stay. Front Desk Supply focuses on making high quality products with a memorable design. Guests won’t forget where they stayed! 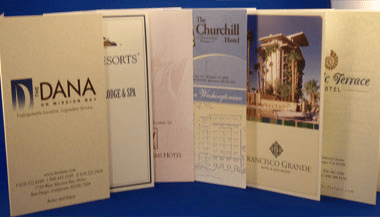 Hotel Key Jackets, Hotel Key Card Sleeves and Hotel Key Folders are the first thing a guest sees when checking in and is a highly visible item.